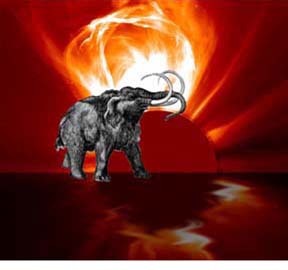 Research suggests that the Sun was highly active between 16,000 and 11,000 years ago; see dissertation excerpt Chapter 4. LaViolette hypothesized that this extreme level of flaring activity resulted because the Sun was accreting dust and gas from its dust congested surroundings during this superwave “storm interval”. During this time the sun would have emitted super-sized solar proton events (SPEs), intense volleys of solar cosmic rays, and super coronal mass ejections (CMEs), immense spherical masses of coronal plasma. These would have been large enough to have posed an extreme hazard for life on Earth. There is evidence that one particularly tragic SPE impacted the Earth around 12,900 years ago, evidence of which is recorded in ocean sediments and polar ice as a spike in both atmospheric C-14 and nitrate ion concentration, the largest to occur during the entire Younger Dryas/Alleröd climatic period. (19) This event happened to coincide with the termination boundary of the two millennium-long Pleistocene mass extinction, beyond which one finds few surviving Pleistocene mammals. This is believed to have been the worst animal extinction episode to occur since the extinction of the dinosaurs 65 million years ago. Animation of a coronal mass ejection leaving the Sun and eventually impacting the Earth’s magnetosphere.